Stainless steel case with a white leather bracelet. Fixed stainless steel with tachymeter bezel. White mother of pearl dial with silver-tone hands and Arabic numeral hour markers. Luminiscent minute markers around the outer rim. Date display at the 4 o'clock position. Three - 60 second, 12 hour and 1/10 of a second. Swiss chronograph quartz movement. Scratch resistant sapphire crystal. Steel with selector buttons crown. Stainless steel screw down case back. Case diameter: 41 mm. Case thickness: 12 mm. Tang clasp. Water resistant at 100 meters / 330 feet. 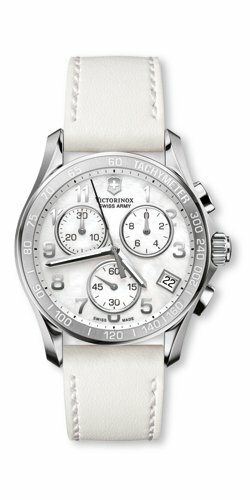 Victorinox Swiss Army Classic Ladies Watch 241418.